Things in the Chesapeake Bay, an estuary that’s been plagued by pollution for decades, have been looking pretty good in the last few years, environmentally-speaking. The volume of dead zones, areas of low- to no-oxygen in the bay, has been on a downward trend. Fewer nutrients — including nitrogen and phosphorus, which are the main causes of the dead zones — have been entering the bay. Water quality is improving: Underwater grasses, which produce oxygen, have reached their highest acreage ever recorded over the past two summers. These grasses need clear water to survive, making them a main indicator of water quality. This year, though, the bay could hit a major bump in the road to recovery. The estuary, which sits off the coast of Maryland and Virginia, is predicted to have a dead zone of about 1.89 cubic miles — larger than usual for the bay. These dead zones aren’t out of the ordinary for the Chesapeake Bay, which experiences seasonal, human-caused areas of low and no oxygen that grow in the spring as runoff carries excess nutrients from surrounding farmland into the water. But this year, thanks to heavy rains, more nutrient-heavy runoff has been carried into the bay than usual, creating conditions for a larger dead zone. This prediction comes as the funding for the bay’s cleanup program is on the federal chopping block. To address the decades of agricultural, pharmaceutical, and chemical pollution that had been dumped into the bay, the Environmental Protection Agency implemented the Clean Water Blueprint in 2010. The plan, which was created at the request of the six states (plus the District of Columbia) in the Chesapeake Bay watershed, established total maximum daily loads (TMDLs) for how much nitrogen, phosphorus and sediment could enter the bay. So far, it’s working. But the White House’s proposed 2018 budget would eliminate EPA funding for the Chesapeake Bay cleanup, as well as for other regional cleanup programs such as the Great Lakes Restoration Initiative. In the Chesapeake Bay, that federal money is used for grant programs for farmers and local governments, for state governments to conduct inspections of farms, and for scientists to monitor the size of the dead zone and the amount of pollution going into the bay. Eliminating the funding for the program would also eliminate the 90 EPA employees who oversee the cleanup. EPA head Scott Pruitt has opposed the cleanup of the bay in the past. When Pruitt was attorney general of Oklahoma he joined 20 other attorneys general in signing an amicus brief in support of a lawsuit attempting to block the EPA’s program. At the time, the attorneys general argued that the cleanup program was a violation of states’ rights, and that if the program was left to stand, the agency could implement similar pollution limits on other U.S. watersheds. The proposal to end funding for the program has been met with pushback. Earlier this year, 12 Democrats and five Republicans in the U.S. House wrote a letter to Trump urging him to keep the EPA funding for the Chesapeake Bay. Members of Congress in the states surrounding the bay support the cleanup efforts. And while the funding for the program was also proposed to be cut in the Fiscal Year 2017 budget, which runs through September of this year, Congress ended up preserving funding for the program. If the funding does get cut, groups in the watershed will be on the lookout for new funding sources. One idea is a focus on private dollars — and on money coming from bay-area residents, who can purchase “Treasure the Chesapeake” license plates. McGee is hoping it won’t come to that — she said CBF is planning to “fight like heck” in Congress to ensure the funding is kept in place. The EPA’s goal of reducing nutrient loading into the bay is important because dead zones, which are caused by this nutrient pollution, can take a serious toll on marine systems. Dead zones form when nutrients enter a body of water and act as fertilizer for algae. This algae eventually dies and sinks to the bottom of the lake or ocean, where it is eaten by bacteria. These bacteria use up oxygen as they eat the algae, and if this deep water isn’t able to mix with higher, more oxygen-rich water, hypoxic — or low-oxygen — regions will form. The lack of oxygen kills off clams and worms, which are key food sources for the Chesapeake Bay’s iconic blue crabs. The bay’s blue crab population plummeted in the 1980s and 90s, due in part to the heavily-polluted water, but has begun to bounce back in recent years. Fisheries in other parts of the country can also be affected by dead zones. 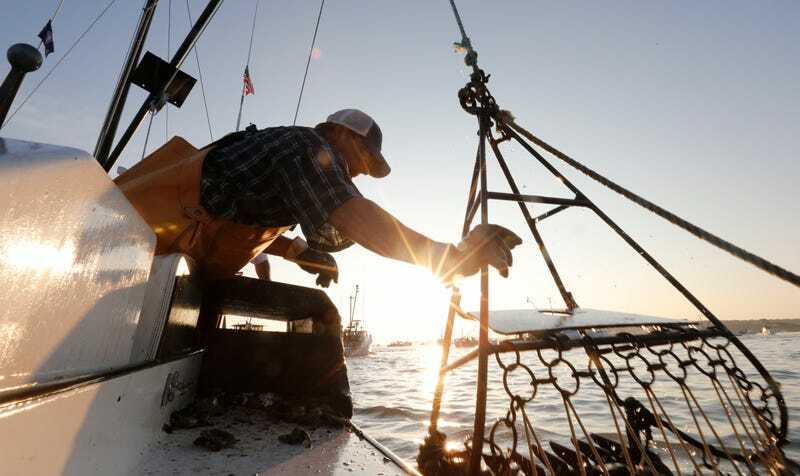 Shrimp, for instance, may not be able to grow as quickly under the particularly large dead zone predicted this summer in the Gulf of Mexico, which could spell trouble for the region’s seafood industry. That can mean consumers end up paying higher prices for seafood impacted by dead zones. The area of low- to no-oxygen in the Gulf this summer is predicted to reach its third-largest size since record-keeping began: 8,185 square miles, which is about the size of New Jersey. Unfortunately, it isn’t just the Chesapeake and the Gulf that are being affected by these dead zones. They’re popping up in more and more of the world’s waters. These increases are partially due to more people looking for dead zones, he said, but also due to the fact that more dead zones are forming, thanks in part due to climate change. Warmer water holds less oxygen, so as water temperatures increase, the chance of dead zones forming also goes up. In addition, as climate change can lead to heavier rainfall in some regions, increased nutrient runoff could lead to larger dead zones. The sources of these nutrients depend on the location of the dead zone. In less-developed countries, untreated sewage is one of the biggest contributors to dead zones, Diaz said. This means there’s a straightforward way of addressing dead zones in these regions: As long as proper sewage-treatment mechanisms are put in place, the dead zones are likely to decrease — or even disappear. In places like Europe and North America, dead zones are almost exclusively caused by agricultural runoff. To shrink the size of these dead zones, a reduction in nutrient loading from agricultural sources is crucial, which Diaz said means eating less meat so that fewer animals have to be raised for food sources and finding ways for farmers to use less fertilizer on their crops. There have been success stories: When the Soviet Union collapsed in the early 1990s, fertilizer subsidies went with it. Without excess fertilizer running into the Black Sea, the region’s once-massive dead zone was wiped out. “In a period of four years, the dead zone went from 20,000 square kilometers to zero,” Diaz said. With the help of the United Nations, the dead zone hasn’t returned to the size it once was — there has only been a few periods since 2004, Diaz said, where the region has seen small dead zones.